Victor Nicholas “Vic” Cabas was born January 15,1920 in New Castle, Pennsylvania, to Louis J. and Elizabeth (Tetu) Cabas, Romanian immigrants. He attended West Side, Lincoln-Garfield School, Ben Franklin and New Castle High Schools, graduating in 1938. He was the manager of the New Castle High football team in 1937 and attended Mt. Union College, Alliance, Ohio. Cabas was working at an aircraft factory in Alliance, Ohio, in 1939 and was already a well known local flier. At the age of 19, he was hired by the English government to ferry bombers from Canada to England and enlisted with the Royal Canadian Air Force in March 1941, with which he served until September 1942. While with the RAF, he had 51 fighter missions, and flew from a base on the Rock of Gibraltar. He was also said to have piloted Winston Churchill during the war. 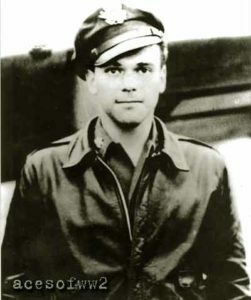 Cabas joined the American Air Corps as a First Lieutenant while in England, after the United States’ entry into the war, becoming one of the few American pilots to have flown a British Spitfire. He fought over the English channel in the Battle of Britain, in Egypt, France, Battle of the Bulge, Italy and Germany. He was awarded the Distinguished Flying Cross in March 1944, while a combat pilot in the North African Campaign. 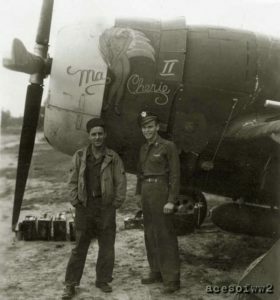 Cabas was promoted to captain in 1944, while with the 494th Fighter Bomber Squadron, 48th Fighter Bomber Group while stationed in England, at which time he had flown over 125 missions. Later that same year, he was promoted to Major while with the Ninth Air Force Fighter-Bomber Base in Belgium, flying P-47 Thunderbolts. He was credited with downing five and a half German planes. After the war, Cabas was stationed for two years at Bad Kissingen, in the Occupied Zone in Germany. Coming back to the states in 1947, he was stationed at Langley Field, VA. He became the Director of Operations for the 363rd Tactical Reconnaissance Group at Shaw Field, South Carolina in 1951 and served as Chief, Reconnaissance Operations, 67th TRW (Tactical Reconnaissance Wing) in Korea in 1953. While Commander of the 10th Air Wing at Alconbury (England), Col. Cabas was selected to attend the National War College in 1963. As the U.S. began sending combat troops to Vietnam, he was assigned Commander, 363rd Tactical Reconnaissance Wing at Shaw Field, South Carolina. At this post, from 1965-1967, he did full time training of reconnaissance aircrews, preparing pilots to meet the demands of Southeast Asia. In August 1967, he was transferred to the 432nd TRW in Southeast Asia. 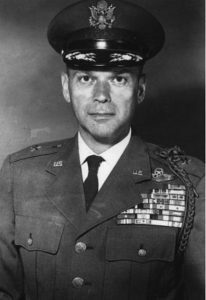 In 1968, Col. Cabas was awarded his 3rd Distinguished Flying Cross at Udorn Air Force Base in Thailand. Decorated for extraordinary achievement as an F-4 Phantom pilot during aerial flight over North Vietnam. He was the Commander of the Wing at Udorn at the time, a Rescue Mission Squadron. By 1971, he had become the Assistant Deputy Chief of Staff for Operations, Pacific Air Forces at Hickam AFB Hawaii. A rated command pilot, he had more than 3900 hours flying time by 1963 and 230 combat missions. He was said to have seen as much aerial warfare as any man alive. In addition to his three Distinguished Flying Crosses, his decorations include the Air Medal with 27 oak leaf clusters, Distinguished Unit Citation, Croix de Guerre avec Palme, Order of Leopold with palm and rosette, Croix de Guerre with star, Belgian Fourragère, the Commendation Medal, King’s Medallion and Battle of Britain Ribbon, U.S. Presidential citation, and the Canadian Battle Ribbon, maple leaf. He had 10 campaign stars for service in Europe, Africa and Korea. In December 1971, Brigadier General Victor N. Cabas retired, after 32 years of service, to Palos Verdes, California. During WWII, he met a Belgian woman from Brussels, Nellie Jeanne Laurie Piteus du Pont, and they married November 15, 1945. They had two children.